We figured that consumers would be the best judges for us ... designers submit ideas and then asks customers to vote on them. Only the top vote getters are offered for sale. Crowdsourcing is the marketing equivalent of 'asking the audience' in a radio show. The first use of the term crowdsourcing is usually attributed to a 2006 Wired magazine article "The Rise of Crowdsourcing by Jeff Howe. Howe argued that the rise of cheap consumer electronics means that 'the gap between professionals and amateurs has been diminished'. 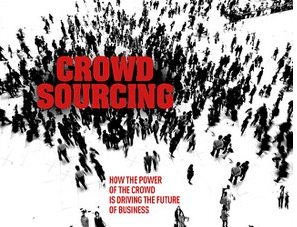 Now companies can tap the knowledge of an informed public: "It’s not outsourcing; it’s crowdsourcing." Interestingly Steve Jobs took the opposite approach, often quoting the apocryphal Henry Ford's line,"If I had asked people what they wanted, they would have said faster horses." As the joke goes: Q. 'What's the Apple version of a focus group? A. The left side of Steve Jobs' brain talking to the right side.